2015, Pottier A. et al. 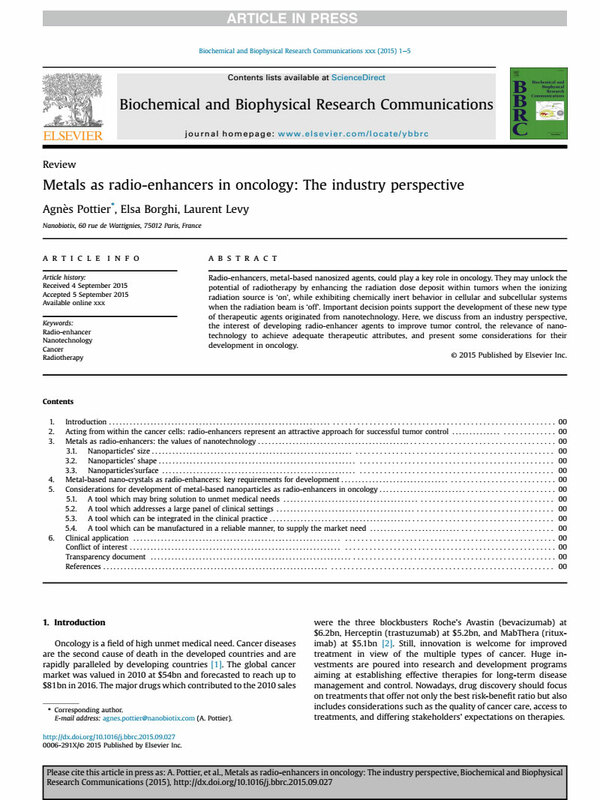 Nano Publications > Publications > Reviews > 2015 – Metals as radio-enhancers in oncology – Pottier et al. 0006-291X/© 2015 Published by Elsevier Inc.
Radio-enhancers, metal-based nanosized agents, could play a key role in oncology. They may unlock the potential of radiotherapy by enhancing the radiation dose deposit within tumors when the ionizing radiation source is ‘on’, while exhibiting chemically inert behavior in cellular and subcellular systems when the radiation beam is ‘off’. Important decision points support the development of these new type of therapeutic agents originated from nanotechnology. Here, we discuss from an industry perspective, the interest of developing radio-enhancer agents to improve tumor control, the relevance of nanotechnology to achieve adequate therapeutic attributes, and present some considerations for their development in oncology.